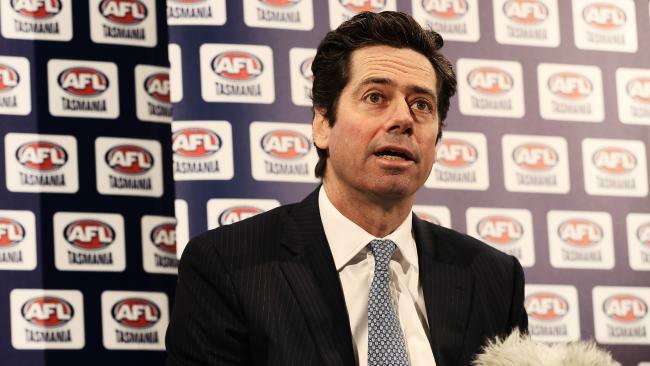 Gillon McLachlan has ruled out segregating fans. FORMER AFL star Brendan Fevola has slammed the 2018 Carlton outfit as the worst side the league has ever seen. The ex-Carlton and Brisbane star took aim at the Blues after a demoralising 72-point loss to Hawthorn on Sunday - their 16th of the season. 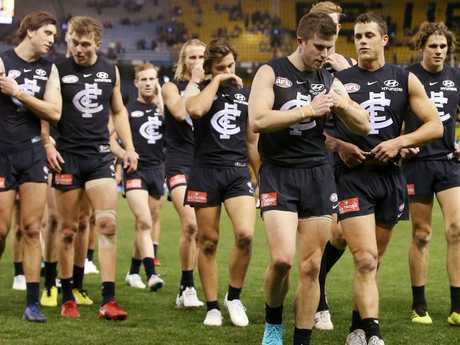 The club has pleaded with supporters to stay patient as it goes through a rebuilding phase but it seems like Carlton is only getting worse as the season goes on and is anchored to the bottom of the table. "It's the worst side ever to play AFL footy," Fevola said on Fox FM's Fifi, Fev and Byron. "It literally is the worst side ever to play football. In the whole history, ever. I played in a pretty crap side, but they are crapper. "We (Carlton) get rid of all the good players and just keep the crap ones." Carlton only kicked one goal in the first half on the weekend but Hawks coach Alastair Clarkson stood up for Blues counterpart Brendon Bolton, saying they were on the right track despite suffering yet another drubbing. "They're on the right track as a footy club," Clarkson said. "It's just really, really hard yards. "It's easy to dig the boots in - I can recall 2005 as a very, very similar position (for Hawthorn). To make matters worse for Carlton, youngster Zac Fisher and defender Liam Jones have both been ruled out for the rest of 2018 after suffering injuries on Sunday. Fisher has a fractured fibula while Jones hurt his knee. The Blues are in a world of pain. The fallout from the weekend's sickening brawl at GMHBA Stadium after Geelong's thrilling win over Melbourne has continued but AFL CEO Gillon McLachlan has ruled out segregating fans. Rather than Cats star Zach Tuohy's goal after the siren to clinch victory commanding the attention it deserved, an ugly fight in the stands stole the headlines. A man in Geelong colours was seen stomping on a man already being held on the ground while a Demons supporter also appeared to hit his head on the concrete after being thrown to ground by another man. McLachlan blasted those involved in the fight but said the league would not start segregating fans. "(Segregation is) not happening," McLachlan said on Triple M Melbourne's Hot Breakfast. "We have seven million people go to our game … everyone gets on famously, it's a part of our game, sitting with opposition supporters, we're able to do it the right way and have a great time. "I'm incredibly proud generally that we can have such a highly supported, passionate game where people can go with supports of the opposition, and segregation is not happening. "The issue here is individual accountability. "It's idiotic, crazy behaviour, and they need to be held to account." Melbourne legend Garry Lyon said the AFL looked "grubby" after the latest brawl, which has followed on from several other incidents of crowd violence earlier in the season. "It makes me sick to the stomach when I see that," Lyon told SEN Breakfast. "I don't know who's to blame for Saturday night. I don't know if it was Melbourne supporters or Geelong supporters, I've got no idea, but it's embarrassing. "Take their membership, chop it up, and suspend them for three years. "We're quick to jump on the soccer crowds when this happens, I tell you what it's happening too regularly for my liking from an AFL perspective. "Our own backyard looks decidedly grubby right now. "I think we as an AFL community have taken a holier than thou attitude to sports events over the journey and now we've got to cop our right whack." GWS provided too tough an obstacle for Port. Port Adelaide coach Ken Hinkley can't help but marvel at the AFL ladder. With five rounds remaining, just a dozen premiership points split third and 12th spot. Richmond and West Coast share top spot with 13 wins and Collingwood is next with 12. Sydney and Port have 11 wins, Greater Western Sydney 10 wins and a draw, and Melbourne, Hawthorn and Geelong all on 10 wins. North Melbourne, Essendon and Adelaide - all with nine wins - also remain a genuine chance of reaching the finals. On a curious ladder, Hinkley's Port lost but kept fifth spot while hometown rival Adelaide won yet slipped a rung. 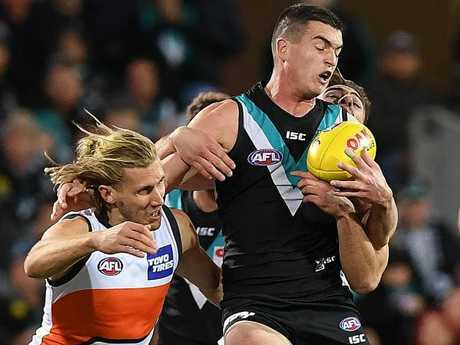 "There's some pretty amazing games coming up in the next five weeks, with who is playing who," Hinkley said after Port's 22-point loss to GWS on Sunday. "We have got some really tough opponents coming up. We have got Western Bulldogs next week in Ballarat, the Crows, WC, Collingwood, Essendon. "It's a tough run. But other teams have got equally as tough run. "It's going to be quite fascinating to see where it all comes out. If you get there (to finals), you're going to deserve it." In finals-shaping games this week, the ladder-leading Tigers meet third-placed Collingwood, while Essendon and Sydney clash. Adelaide host Melbourne, and North Melbourne meet West Coast, in other matches to have a big bearing on the top eight after round 18.
premium_icon Has Sloane reinjured his foot?